Gingerbread is almost synonymous with Christmas and making some to hang on the tree is something I aspire to each year. This year, I’ve actually done it. Not that we have a tree to hang any on, but I’m hoping that the friends we are giving them to will. Reading through a review copy of What to Bake & How to Bake It, I noticed a recipe for iced gingerbread cookies that used treacle as a variation. I find the word treacle very hard to resist – something to do with childhood memories of my mother’s treacle pudding, I imagine. Decision made: I would knock up some gingerbread. I followed the recipe almost exactly, adding only a little chocolate (of course) and a few additional spices. A pinch of black pepper for additional warmth was needed I thought as well as some allspice for Vanesther’s Spice Trail and some nutmeg. What to Bake and How to Bake It by Jane Hornby (published by Phaidon Press at £19.95), is a rather beautiful book. It’s quite a large hardback and has a turquoise textured paper cover that makes me want to stroke it. Two matching turquoise bookmarks add distinction and there are plenty of gorgeous pictures to admire. It appears to be more a work of art than a manual. It’s certainly a book to treasure. As the title suggests, this book is aimed principally at those who are new to baking or who require a confidence boost. Each recipe is spread over four to six pages, with lots of step-by-step aerial photography and accompanying instructions. Ah, so it is a manual, albeit a rather lovely one. Methodologies, terms and equipment are covered at the beginning and there are plenty of tips and tricks to be found throughout. Anyone working through a few of these recipes would learn pretty much everything they needed to turn out fabulous, cakes, breads, biscuits, pies and desserts. Despite this, I think the book is also useful to the more experienced baker; most of us still have something to learn. Creating a Swiss roll is one of my bêtes noirs, so maybe I’ll be able to crack it with the steps shown here. There are fifty recipes in total and although the classics are represented, there is plenty here to keep the more experienced baker interested and inspired. Shortbread is covered for example, but orange, lavender, pecan and chocolate versions are also given. I have my eye on the malted chocolate birthday cake as I’m a sucker for a malteser and if I hadn’t been ill in the run-up to Christmas, I would have made the pistachio and fig biscotti which sounds exotic and comforting in equal measure. Other bakes that might restore me to health include: blueberry-cinnamon crumb cake, cranberry stollen and Linzer cookies. Melted 110g Rodda’s salted butter in a large pan with 200g dark brown sugar, 2 tbsp treacle and 25g dark chocolate. Allowed to cool a little then beat in a duck egg (large hen’s egg would be fine). Beat in 2 drops Holy Lama cinnamon extract (2 tsp ground cinnamon), a drop of black pepper extract and a drop of nutmeg extract. Sifted in 150g wholemeal flour and 200g plain flour, 1 tsp bicarbonate of soda, 1 tsp allpice and a heaped tsp ground ginger. Mixed until just combined, then left in my cold kitchen to firm up for an hour. Gathered the mixture together to form a ball of dough and rolled out on a floured surface to about the thickness of a £1 coin. Cut various shapes from it, rerolling the leftovers again and again until the dough was all used up. Placed biscuits on a lined baking tray and baked at 180C for 7 minutes – mine were quite small and larger biscuits would need a couple of minutes or so longer. Used a chopstick to make holes for threading whilst the biscuits were still hot from the oven, then removed them to a wire rack to cool. Mixed 3 heaped tbsp icing sugar with just enough limoncello to make a thick, but slightly runny icing. Piped this onto my biscuits and left them to dry. The biscuits smelt wonderful, both in and out of the oven and were as warming and delicious as I’d hoped. The touch of limoncello icing gave an added note of sophistication. They may not have looked very sophisticated, but I’m blaming the flu virus for that. CT and I quickly polished off all the rejects and the rest got packed into bags for gifts. I am sending these biscuits of to Vanesther over at Bangers & Mash for The Spice Trail, which is allspice this month. Some are also winging their way to Karen over at Lavender and Lovage who has appropriately chosen sugar and spice for this month’s Cooking with Herbs. Phaidon Press has also kindly agreed to give one of my readers a copy of What to Bake & How to Bake It. To be in with a chance of winning, please fill in the Gleam widget below. You will need to leave a comment on this post, answering the question, which then gives you additional chances to enter if you so wish. Gleam will pick a winner at random from the entries received. If you are commenting anonymously, please give me some way of identifying you as I will be verifying the validity of entries. Any automated entries will be disqualified. This giveaway is only open to those with a UK postal address. Winners will need to respond within 7 days of being contacted. Failure to do this may result in another winner being picked. Prizes are offered and provided by Phaidon Press and Chocolate Log Blog accepts no responsibility for the acts or defaults of said third party. A swiss roll! Mine cracked! I don’t attempt anything that seems difficult so I’m all good 😉 Limoncello icing sounds brilliant though! Nothing comes to mind with what I have found difficult. Definitely macarons were tricky for me – a lot of practice and a masterclass! They are so festive and pretty! I love the idea of limonchello icing – should work really well with the gingerbread! As silly as it sounds, I always struggle with flapjack! It always turns into granola. I bake all the time, and never have issues with other recipes. I can’t work out what I’m doing wrong! These look gorgeous and would make super presents. I find making fudge really tricky! My Sacher Torte was a disaster, but I will try again sometime! Love the addition of Limoncello icing. I love Limoncello!!! 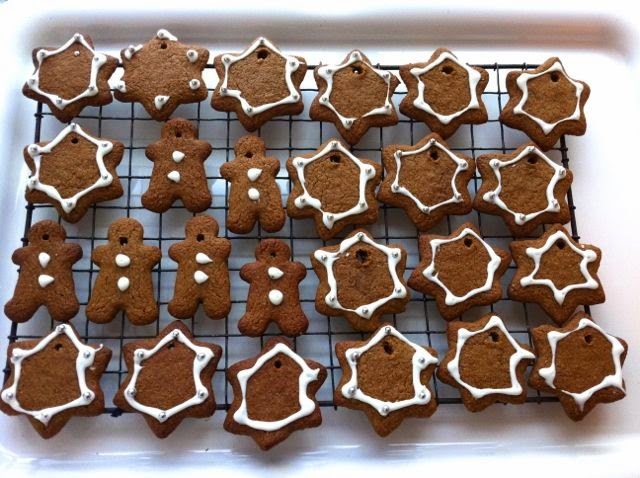 I particularly like the sound of ‘spicy’ gingerbread – will have to have a go at these over Christmas! Lemon drizzle. I always get the sugar/water ratio wrong and just end up with a soggy rather than a crunchy cake! Beautiful biscuits. I can only imagine the fab smell in your house when you baked them! Loving the gingerbread and think I would rather enjoy the book too Choclette. For me it was pancakes. Such a simple thing but while I was happy making much more complicated things, it took me ages to get them right. Thanks so much for sharing your delicious gingerbread in December’s Spice Trail challenge. I absolutely adore gingerbread made with treacle. And isn’t What to Bake such a beautiful book – definitely one of my favourite cookbooks of 2014. Here’s to a very delicious 2015! I burn cookies! I wanna learnnnn! Swiss roll – I can’t get it to roll up. I think I’ve tried all the tricks suggested over time but still find rolling a swiss roll the most challenging of tasks and it looks so simple when it is done properly. Panacotta it would not set. Just a vanilla milkshake after a nugjt in the fridge. Bread, it never seems to rise well. I’d like to conquer the souffle! Swiss roll – it doesn’t! I’m not sure if this counts, but Scottish Tablet! Macaroons – still not mastered them! I once tried to make a croquembouche. What was I thinking? Fudge! it never sets right. I cook a lot of wheat/gluten free but this works much better with certain bakes/recipes than others and can be tricky. Family have a friend who enjoys baking as a hobby, and we enjoy the results. So rarely bake, results usually ok on occasional attempts. Surprisingly, cupcakes. The tops are always really pointy and the fan in my oven is so fierce they go all lopsided. So I end up with wonky volcanoes. I’m such an amateur I even struggle with scones! Biscuits, they are either extremely thin & crispy or ‘cakey’ cant seem to get the consistency right, no matter what type I try to make. Swiss roll, Hard to prevent it from cracking. Swiss Rolls – always fail! scones – as they cool they harden! Anything with caramel. I just can’t for the life of me cook caramel arghh! Chocolate fondants, the middle is never gooey. Macarons – would love to master the art of making them! My chocolate brownies are always hit and miss but still get eaten so may be not so bad! Mince pies just don’t seem to brown evenly on top. I struggle to make Victoria sponges that rise much! my victoria sponge is just hard. I’m never satisfied with my pastry. i find making savoury muffins hard as never can get the flavours quite right. Giant cupcake & egg custard tart. Macarons. I’ve given up now! Birthday cakes, they never seem to cook through right. I find it all difficult to master, but I keep trying!! My Victoria Sponge is dreadful! anything with puff pastry, it never puffs for me. any thing now that involves precision hand work, icing etc. Pastry – I have hot hands! shortbread, never quite crispy enough or burnt! scones my hands are always too warm!! I’ve given up on macaroons … just can’t get them right ! Scones- they’re always so dry! Brandy Snaps always go completely wrong for me! meringue! I used to be able to bake one to perfection but it fails every single time despite using all the tricks in the book!! Millionaires shortbread , I have tried so many times but for some reason I can’t get the base right. My puff pastry never seems to puff! Ganache filling – such a pain! Quiche with a soggy bottom. Scones….just can’t seem to get them right! Biscuits, I can never get the consistency right! profiteroles, i used to make them all the time when i was younger and never seem to get them right anymore! I can never seem to make a good Scone! I can’t get carrot cake right, it’s always soggy in the middle but perfect at the edge, if I cooked it any longer, otside would be over cooked! My scones always go soggy! Pastry is my real problem! baked cheesecake, the tin has always leaked no matter how much I wrap it in tinfoil! Honeycomb, so simple to make but so hard to time right! pavlovas – i can never get these right!